This contest is now closed. Check out our winning entries and keep an eye on our social channels for our next contest! All submissions must be entered by 11:59 GMT -5:00 on January 10, 2019. Submissions will be judged by TurboSquid and industry partners. Meet our judges! Please see Official Entry Rules below for details. Can I include models that I’ve made previously as part of my entry? Of course! We are looking for strong compositions, and if you have models that are suitable for your scene, you may include them. Can I use purchased models in my composition? Yes, entries may contain third party elements, but you must be able to provide proof of any necessary permissions (see Rules below). Do I have to publish my submission on TurboSquid? No. Publishing your entry for sale on TurboSquid is not a requirement of the contest. This contest is purely about the art and vision of the worldwide 3D art community. Can I use Photoshop for my finished render? You can, but only for touch-ups, and slight effects enhancements (glows / depth of field / motion blur, etc. ), levels adjustments, and simple color grading/ hue/ saturation tweaks. No extensive paintovers, 2D backplates, or effects (like bubbles or dust) should be created in Photoshop— these kinds of elements should be generated in 3D. Aside from the aforementioned tweaks, the scene must render as submitted. Yes! We highly recommend focusing on a single entry, but you’re welcome to submit multiple entries if you’d like. Yes! Prizes will be distributed to the account that posts the final submission; it is up to the members of the team to distribute winnings. Can I watermark my renders? You may add non-intrusive watermarking on any works in progress and publicly posted renders for social sharing, but no watermarking is allowed on the final submission render(s) sent to us. ELIGIBILITY: Open to individuals who have a TurboSquid account and are 18 years of age or older. Employees, representatives, freelancers and agents of TurboSquid, Inc. (“Sponsor”), its parent, subsidiaries, affiliates and advertising and promotion agencies, and members of their immediate family (spouse, parent, children, siblings and their respective spouses, regardless of where they reside) and persons living in the same household, whether or not related, are not eligible. Void where prohibited. Contest is subject to all applicable federal, provincial, state and local laws. CONTEST PERIOD: The contest begins at 12:00 GMT -5:00 on October 10, 2018 and ends at 11:59 GMT -5:00 on January 10, 2019 (“Contest Period”). 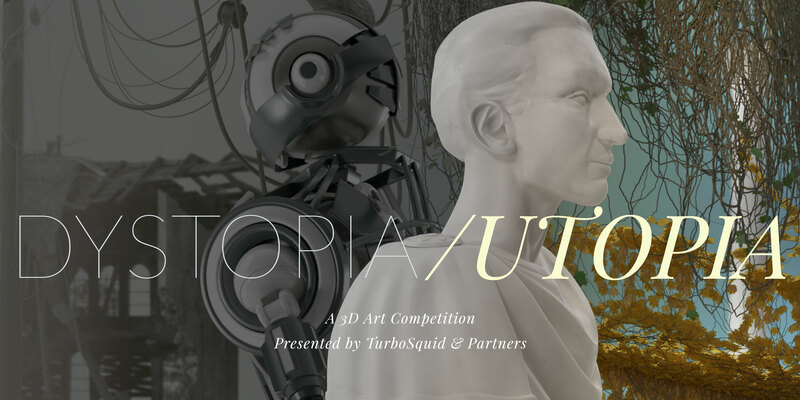 During the Contest Period, create a “Dystopia/Utopia” themed 3D Scene and submit it via the TurboSquid Contest Google Form by following the directions at https://www.turbosquid.com/3d-art-competitions (“Entry”). All Entries must be received by 11:59 GMT -5:00 on January 10, 2019 to be considered. Entry must be an original and unpublished work by entrant. If it contains third party elements, they must be credited in the Entry and entrant must be able to provide proof of any necessary permissions to a form acceptable to Sponsor. Entry will be deemed submitted by the authorized owner of the applicable account. There is no limit on the number of Entries you can submit; however each Entry must be substantially different than any other Entry you submit, as determined by Sponsor in its sole discretion. If you do not have a TurboSquid account, creating one is free. All applicable site terms apply. Entries generated by any means which subvert the Entry process are void. All Entries become the sole property of Sponsor. Sponsor reserves the right to disqualify any Entry that it determines, in its sole discretion, is not in compliance with these Official Rules. PUBLICITY GRANT/ GRANT OF RIGHTS TO ENTRIES: By submitting an Entry, except where prohibited, each entrant (and, if an eligible minor, his/her parent or legal guardian) grants to Sponsor and its licensees, successors and assigns an irrevocable, perpetual, unlimited, royalty-free, fully paid-up license to reproduce, distribute, display, exhibit, exploit, perform, edit, create derivatives of, and otherwise use the Entry and all elements of such Entry, together with any other material, and the name, city and state/province of residence, voice, image and/or likeness of entrant, in any and all media now known or hereafter devised, in any manner, in whole or in part, worldwide, without compensation or notification to, or permission from, entrant or any third party, for any purpose whatsoever, including without limitation, for purposes of advertising or trade. Entrant (and, if an eligible minor, his/her parent or legal guardian) agrees that he/she may be required to sign a document to this effect. Sponsor has no obligation to make use of the rights granted herein. Adherence to the theme of “Dystopia/Utopia” (collectively, “Judging Criteria”). In the event of a tie, a tiebreaker judge will judge the tied Entries using the Judging Criteria to determine the winner(s). Sponsor reserves the right to not award all prizes, in its sole discretion, if it does not receive a sufficient number of eligible and qualified Entries. All decisions of the Sponsor and judges are final and binding. Sponsor will not reveal the judging scores for any Entry. WINNER NOTIFICATION: Potential winners will be notified via email. Potential winners will be required to execute and return a Declaration of Eligibility, and a Liability Waiver and, unless prohibited, a Publicity Release within ten (10) days of date of issuance. If a potential winner does not respond to the initial notification within the time period stated, all required documents are not returned within the specified time period, a prize notification or prize is returned as undeliverable, or a potential winner is not in compliance with these rules, prize will be forfeited and, at Sponsor’s discretion, a runner-up for the Category at issue may be notified. If winner is at least 18 but still considered a minor in his/her jurisdiction of residence, Sponsor reserves the right to award the prize to winner’s parent or legal guardian, who will be responsible for fulfilling all requirements imposed on winners set forth herein. In the event any prize cannot be awarded due to the laws and regulations of the winner’s jurisdiction, Sponsor will substitute a prize of comparable or greater value. For example, if cash cannot be awarded, Sponsor will substitute a gift card of equal value. Subscription services are subject to the terms and conditions specified by the applicable provider. Prizes are non-assignable and nontransferable and cannot be redeemed for cash. Prizes are awarded “as is” with no warranty or guarantee, either express or implied. Winners responsible for all federal, provincial, state and local taxes (including income and withholding taxes) associated with prize acceptance and use not specified herein as being provided. Winners may not substitute a prize, but Sponsor reserves the right, at its sole discretion, to substitute prize (or portion thereof) with one of comparable or greater value. All prize details are at Sponsor’s sole discretion. Limit one (1) prize per person. GENERAL CONDITIONS: By participating, each entrant (and, if an eligible minor, his/her parent or legal guardian), except where prohibited, agrees: (a) to abide by these Official Rules and decisions of Sponsor and judges, which shall be final and binding in all respects; and (b) to release, discharge, hold harmless and indemnify Sponsor, its parent, subsidiaries, affiliates and advertising and promotion agencies and all of their respective officers, directors, employees, representatives and agents (collectively, “Released Parties”) from any and all injuries, liability, losses and damages of any kind to persons, including death, or property resulting, in whole or in part, directly or indirectly, from entrant’s participation in the contest or the acceptance or use of a prize. Except where prohibited, Released Parties are not responsible for (i) lost, late, incomplete, damaged, inaccurate, stolen, delayed, misdirected, undelivered or garbled Entries, emails or other communications; (ii) lost, interrupted or unavailable network, server, Internet Service Provider (ISP), website, or other connections, availability or accessibility or miscommunications; (iii) failed computer, satellite, telephone or cable transmissions, lines, or technical failure; (iv) jumbled, scrambled, delayed, or misdirected transmissions or computer hardware or software malfunctions, failures or difficulties; (v) other errors or difficulties of any kind, whether human, mechanical, electronic, computer, network, typographical, printing or otherwise, relating to or in connection with the contest, including, without limitation, errors or difficulties which may occur in connection with the administration of the contest, the processing or judging of Entries, the announcement of the prizes or in any contest-related materials; (vi) any incorrect or inaccurate information, whether caused by users, tampering, hacking, or by any equipment or programming associated with or utilized in the contest; or (vii) injury or damage to any person’s computer related to or resulting from participating in this contest. Persons who tamper with or abuse any aspect of the contest or Sponsor social media account, who act in an unsportsmanlike or disruptive manner or who are in violation of these Official Rules, as solely determined by Sponsor, will be disqualified and all associated Entries will be void and Sponsor may request entrant remove the Entry from the platform. Should any portion of the contest be, in Sponsor’s sole opinion, compromised by virus, worms, bugs, non-authorized human intervention or other causes which, in the sole opinion of the Sponsor, corrupt or impair the administration, security, fairness or proper play, or submission of Entries, Sponsor reserves the right at its sole discretion to suspend, modify or terminate the contest and if terminated, at its discretion, select winners for the Categories at issue from among all non-suspect, eligible Entries received for such Categories up to time of such action using the winner determination procedure set forth above or as otherwise deemed fair and appropriate by Sponsor. Sponsor’s failure to enforce any term of these Official Rules shall not constitute a waiver of that provision. Should a winner make any false statement(s) in any document referenced above, the winner may be required to promptly return to Sponsor his/her prize, or the cash value thereof. WARNING: ANY ATTEMPT BY AN ENTRANT OR ANY OTHER INDIVIDUAL TO DELIBERATELY DAMAGE ANY WEBSITE ASSOCIATED WITH THIS CONTEST OR UNDERMINE THE LEGITIMATE OPERATION OF THE CONTEST IS A VIOLATION OF CRIMINAL AND CIVIL LAWS, AND SPONSOR RESERVES THE RIGHT TO PROSECUTE AND SEEK DAMAGES (INCLUDING, WITHOUT LIMITATION, ATTORNEYS’ FEES) AND OTHER REMEDIES TO THE FULLEST EXTENT PERMITTED BY LAW. Dispute Resolution: Except where prohibited, by participating in this contest, each entrant (and, if an eligible minor, his/her parent or legal guardian) agrees that: (a) any and all disputes, claims, and causes of action arising out of or connected with this contest, or awarding of the prize, shall be resolved individually, without resort to any form of class action; and (b) any and all claims, judgments and awards shall be limited to actual out-of-pocket costs incurred, including costs associated with participating in this contest and in no event will entrant be permitted to obtain attorneys’ fees or other legal costs; and (c) under no circumstances will any participant be permitted to obtain awards for and hereby waives all rights to claim punitive, incidental, and consequential damages and any other damages, other than for actual out-of-pocket expenses, and any and all rights to have damages multiplied or otherwise increased. Some jurisdictions do not allow the limitations or exclusion of liability for incidental or consequential damages, so the above may not apply to you. WINNERS LIST: For the names of the winners, send an email to contests@turbosquid.com by no later than January 31, 2019. Sponsor: TurboSquid, Inc., 935 Gravier Street, Ste. 1600, New Orleans, LA 70112.